To connect with like minded people who are striving for mental and financial independence. 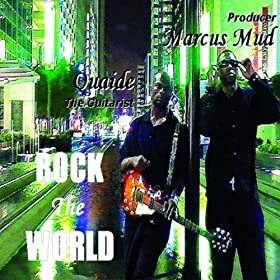 Marcus Mud & Quaide (Ax in hand) is the dynamic duo from Houston, TX. Though they where buddy's at Langham Creek High, their musical influences where extremely contrasting which ultimately attributes to their unique sound. Combining their engaging style with their appealing lyrical content. The tandem aspires to make music that sets them apart from the mainstream providing the listener with a diverse flavor fusing genres that leaves an imprint . Their purpose? To perfect the art of story telling expounding on narratives that produces reflection, healing, and a sense of transformation that only comes through experiencing the journey of life. Making music that people can vibe to while impacting awareness to the challenges everyone faces on a daily basis. Documenting the duality of life and the balance between struggle and prosperity. Hesitation isn't in the cards when it comes to expressing and exploring the depths of luv, vulnerability, and the resiliency of the human spirit. Proposing yet empathizing leaving each individual to make a choice. The duo sets no boundaries when it comes to topics or situations that must be addressed. Promoting their latest collaborations in Houston's illustrious club & bar scene. H-Town's diamond in the rough focus is on expanding it's fan base, continue to make great music, and perform high energy shows. Twitter! . Get updates and the latest news about their endeavors. Just listened to "boogie" and it sounds great!! I love the electric! Gourmet Coffee shipped to your front door. Tired of the excess? Learn what they don't want you to know. "Lose Inches Off Your Waist Fast": · bit.ly/SuQy24. Do it the healthy way. Marcus Mud & Quaide "System Of Rhythm". Superbly done on a budget. A person of power embraces challenges in complete gratitude. No matter the situation life may bring, discontent is never justified, rather all is experienced as an opportunity and a priviledge to adventure and grow. Live @ The Jet Lounge the duo put's on a rare performance. Like their FB Fan Page by clicking the banner below. Much Luv! Marcus Mud & Quaide featured on JPBTV - "Rising Stars" wit DaGrinda. I have something very vital to disclose with you, but I found it difficult to express myself here, since it's a public site.Could you please get back to me via my direct email(d.dusch55@gmail.com) for the full details. thanks for reaching out! blessings to you and yours. Remember, you may post your music on our music player. And, no one knows you if you don't make friends and meet people. I notice you have no friends here. Set out and promote yourself.